For all seasons maintenance we we offer a wide range of things. We can set it up for a yearly package or a one time thing. 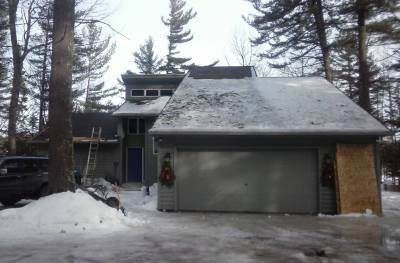 We will shovel your roofs,decks and sidewalks off in the winter months. Spring we can fertilize and seed your lawns, patch your yard from the damage cuased from winter plowing. Summer we can keep you yard looking sharpe by triming trees and keeping your lawn cut. Fall we will rake your yard, clean gutters and roofs off. Repairs are often in spring after a hard winter, from broken gutters to decks falling apart. Whatever the proplem is we can come out and usally fix it within a day or two depending how busy we are or if we have to order material. Need a new roof or a leak fixed? We can help with all your roofing needs. We do shingle, metal, and rubber roofs. We only use the best materials and do it at an affordable rate. We also seal trailer homes and campers with a roll on seal coat. We can remove moss and the black mold and help prevent it from happening year after year. We also do new constuction or additions. If its hard getting down to the lake we can build you log or pressure treated steps. We also can just put a railing in depending on your needs. If you have preestisting set of stairs or an old railing we can add on or make any repairs before you deside you need a hole new set of stairs. If your siding is starting to lose its sheen its about time for another coat of stain. To start out we look over your siding, if it is wood we look to make sure there is no rot first. Then we make sure it has been properly chaulk so moister doesnt get behind the siding. If everything checks out we spary a cleaner on your siding and scrub the dirt and mold off and then power wash it down. We let it dry for a few days till it is dry, then comes stain. Some sides facing the sun may need an extra coat to properly seal your siding, same goes for paint. We tend to get your pier in before any other company will. We charge a very fair rate usally below are competitors and are friendly to asist your needs of how you want your pier faceing. We are the last to pull are piers out every year so you can injoy the water as long as the weather permits. We also can fix your old wood piers or build you a new aluminum or wood pier. If you already have a company that installs and removes your pier but want to pay less give us a call and we can work out a yearly price. We also adjust piers for a low fee, sometimes the water level drops and you want your pier a bit closer to the water well we can do that also.